I love it when my ancestors find their voice and through their own words give something of their personalities. Obviously, their voice is not audible, but through Letters to the Editors, wills or even as witnesses for an inquest, it is then easier to imagine them speaking. 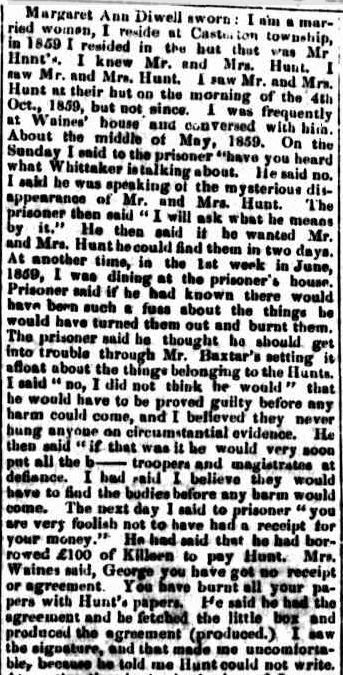 In my post Witness for the Prosecution, I wrote of ggg grandmother Margaret Ann Turner, married to William Diwell, and her experience as a witness in a murder trial in 1860 at Casterton. 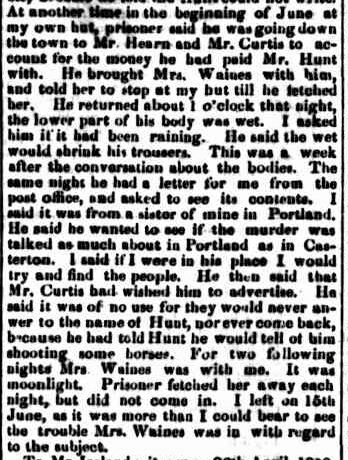 Previous newspaper reports had only mentioned her role, but an extensive report of the trial in the Portland Guardian and Normanby General Advertiser of 20 April 1860 brings Margaret to life as she describes her conversations to the defendant, George Waines, prior to his arrest. Of course, give consideration to the abilities of the person recording the events. This article tells me a lot about my ggg grandparents. 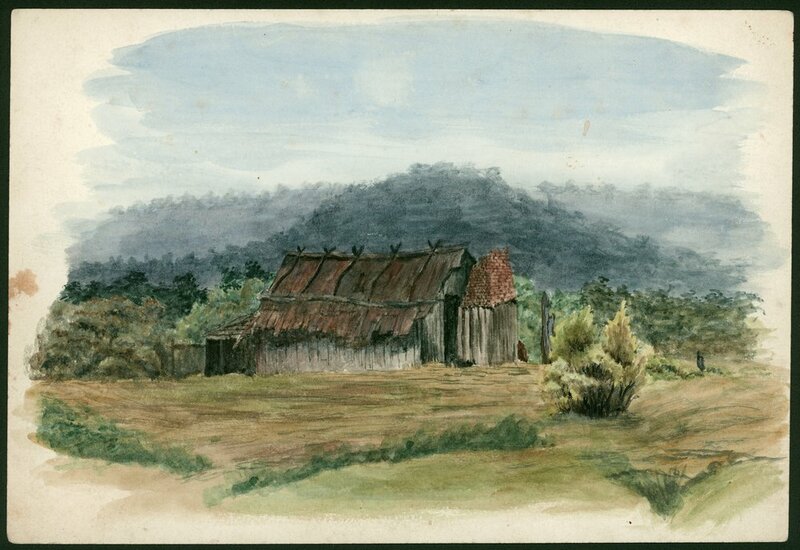 It reconfirmed they were in Casterton in 1859 and Margaret said they were residing in a hut owned by Mr Hunt. Also, Margaret must have been good friends with Mrs Waines spending a lot of time at their house, including dining there on occasions. She makes no mention of William or the six children. More revelations. 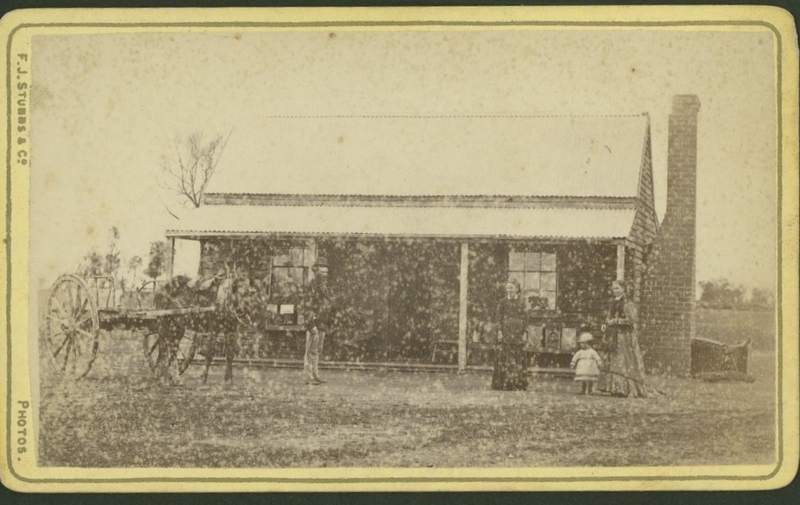 George Waines dropped his wife off at Margaret’s hut one night. Mrs Waines then stayed a further two nights with George returning each night to take Mrs Waines away. Margaret stated she left on 15 June 1859 because she couldn’t bear to see Mrs Waines put through such torment. So did Margaret leave her own hut and if so, where did she go? Once again where were William and the six children? One would think if William was around during these events, he too would have been called as a witness. William was a bricklayer and worked in surrounding towns so this may explain his apparent absence. Notice too that Margaret describes the Waines’ abode as a “house”, but the Diwells and Hunts lived in huts. They were most likely slab huts like the one below. The Waines lived in a “house” so it may have been more substantial like the one below, or perhaps larger if George Waines’ aspirations were any indication. Another thing that caught my attention was Margaret’s mention of a sister from Portland. That sent me scurrying to the records as I have never found any of Margaret’s siblings and I would have thought they were back in Surrey. A quick search of the1841 UK Census records (again) and the Australian Death Index gave me nothing, but I will keep searching. Or was it just a ruse by Margaret to throw Waines off his interest in her mail. It is sometimes difficult not to think of ggg grandparents as anything but old. Reading this latest find has reminded me that Margaret was only thirty-six during the events leading up to the trial which has also reminded me that Margaret lived for only another nine years after the trial. She was forty-five when she died, only a little older than me. Margaret never became the old woman I must stop myself imagining her as. There has also been another development in my family’s association with the Hunt murders. Another descendant of my ggg grandfather George Jelly contacted me recently. George’s daughter Elizabeth married Margaret Diwell’s son Richard in 1877. Judy was kind enough to send me a copy of George’s obituary. It tells of George’s swimming prowess and how he dived for the bones of the Hunt’s in the Glenelg River. Unfortunately, I cannot find anything in the various reports about George’s efforts, despite it being mentioned that there was a river search and bones found. 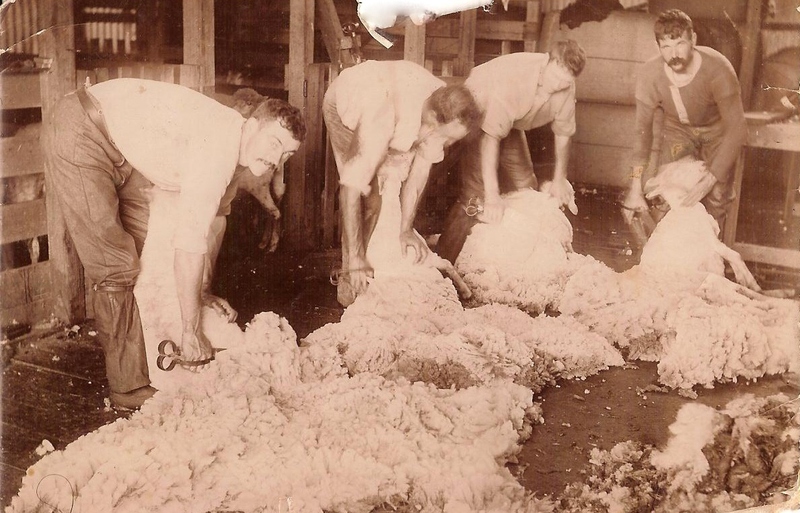 This entry was posted in Diwell, Western District History and tagged Casterton, Diwell, Jelly. Bookmark the permalink.